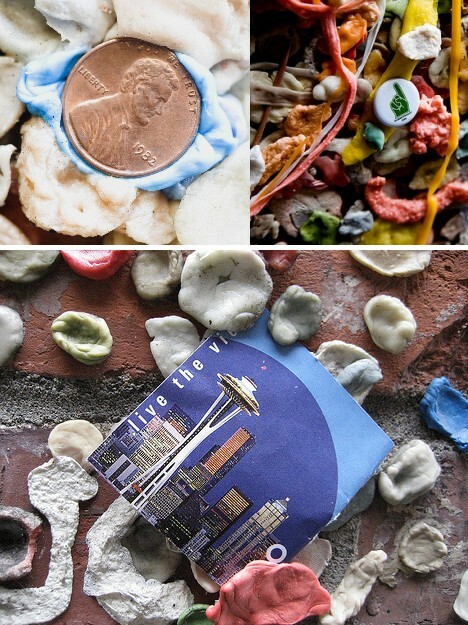 The “Gum Wall” takes the concept of sticktoitiveness to a new level – actually, 15 feet above Post Alley in Seattle‘s famous Pike Place Market. The wall’s owners no longer bother scraping away the gooey graffiti, no doubt causing those who “chews” to add a wad to what’s been called one of the world’s germiest tourist attractions to drool with anticipation. Got the gumption to check out a little chicle culture? 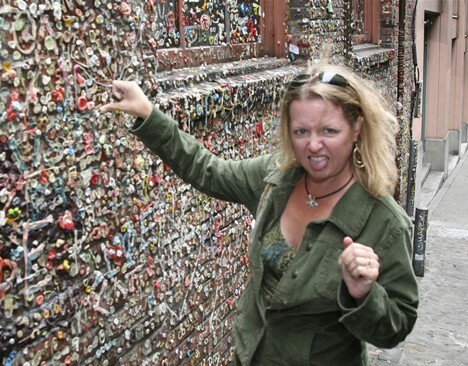 Gum is all you need, and the culture (of the microbial kind) looks after itself. 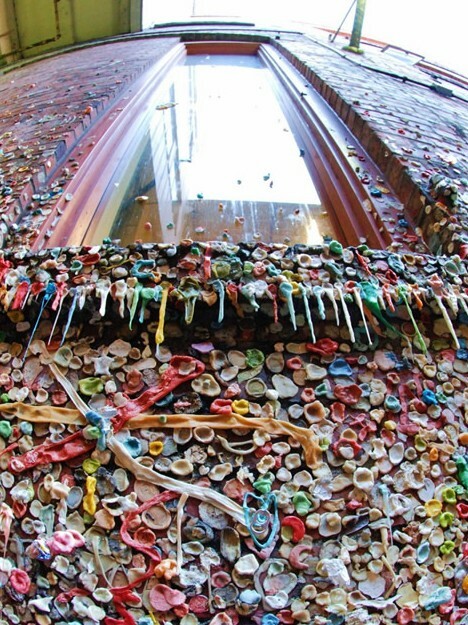 We’re talking about the Gum Wall, of course, the only Seattle attraction guaranteed to keep you sleepless – especially if you’re from Singapore. 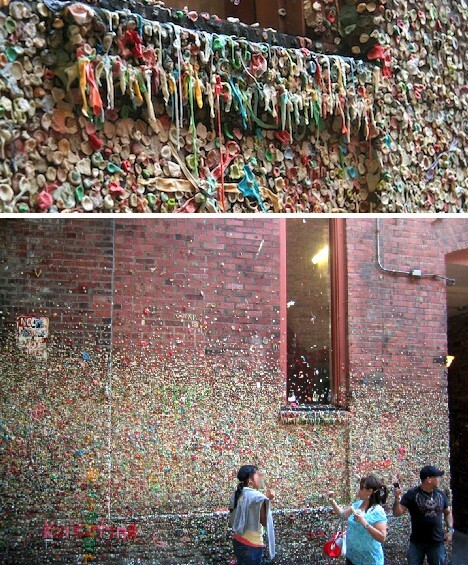 The Gum Wall runs for about 50 feet along Post Alley, where paying customers to the Market Theater in Pike Place Market would wait in line for the next show to begin. 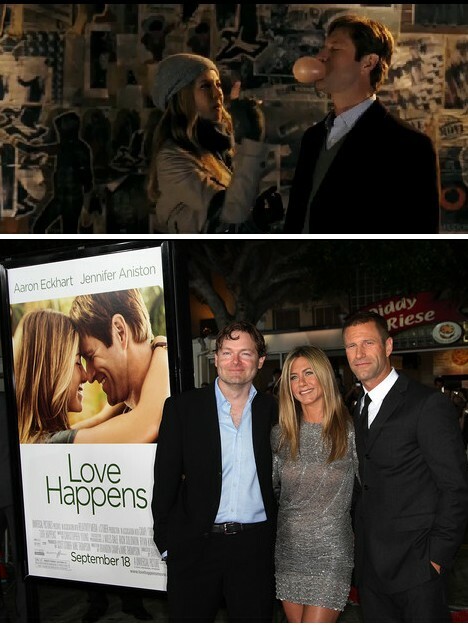 Evidently the wait was too long for some theater-goers – long enough, at least, that their chewing gum lost its flavor. Lacking a handy bedpost (as in the classic tune by Lonnie Donegan popularized on the Doctor Demento radio show) to stick it on, antsy chewers chose the next best thing… well, the NEXT thing, which happened to be the brick wall bordering Post Alley. 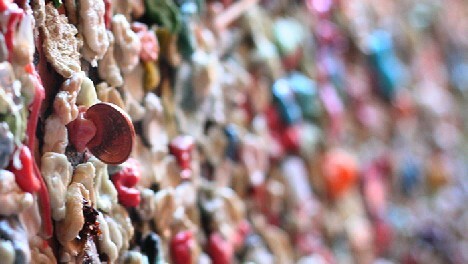 At first (around 1993), gum-stickers used their chicle chaws to affix coins to the wall but, times being tough and all, eventually the coin part lost favor as fast as gum loses its flavor – coins stayed in pockets while gum stayed on the wall. The same goes for other objects fastened to the wall using gum as a sort of Mac-Tac: postcards, written messages, buttons and business cards, for example. Paper doesn’t last long out in the open, though, and with the passage of time the gum remains while more ephemeral materials decay. Gum itself is stretched, molded and arranged to form a variety of miniature self-contained artworks, names and symbols. These features utilize the intrinsic properties of chewing gum: soft and malleable when freshly chewed; tough and colorfast when dried. The owner of the building (Unexpected Productions’ Seattle Theatresports) was less than impressed by what they saw as a rapidly expanding gum-bomination and hired crews to scrape the wall clean at least twice (and you think your summer job is lousy) but gave up in 1998 when officials at Pike Place Market noticed that people were, often as not, lining up to see the Gum Wall instead of the current theatrical production. Things took off from there: in some places the gummy deposits are several inches thick. Ick! 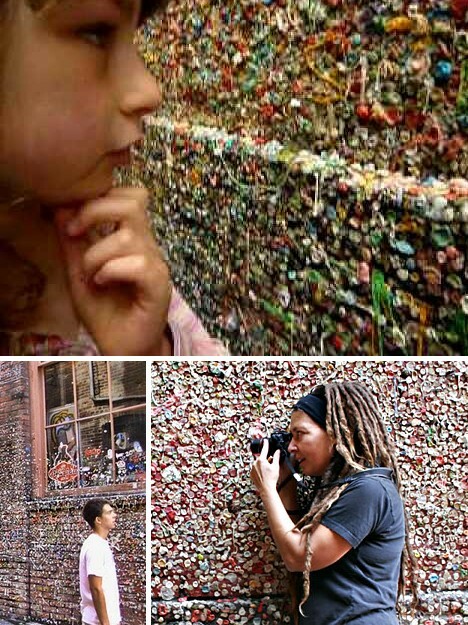 Mention has been made of the “gross factor” of the wall, including CNN who in 2009 lumped the Gum Wall in with their list of the 5 germiest tourist attractions. While undeniably gross to some – the “distinct fruity aroma” CNN describes surely doesn’t help – it’s debatable whether pathogenic bacteria native to human mouths can survive for long after being stuck on a brick wall. Also, gum stuck on the Gum Wall STAYS on the Gum Wall. People aren’t working some bizarre gum-trading scheme, nor are they kissing Ireland’s Blarney Stone (also on CNN’s list), which receives around 400,000 visitors annually (and usually, orally). 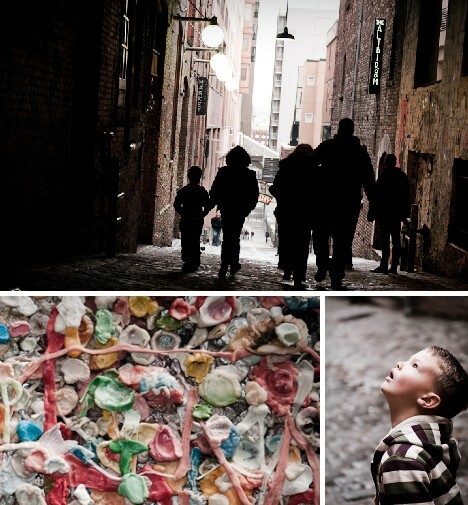 But back to the Gum Wall, or “Wall of Gum” as some refer to it. From afar, the multicolored blobs of solidified Trident, Wrigley’s, Bazooka and more blend into a rainbow tableau that blurs the lines of the geometrically placed brickwork. 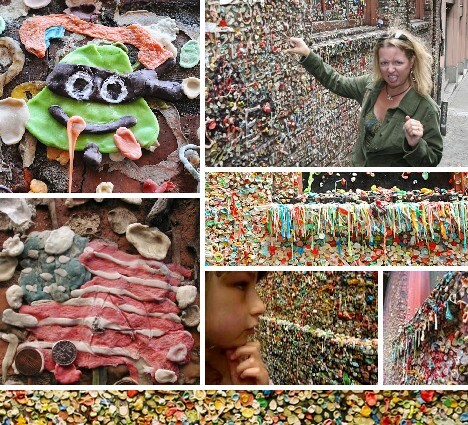 Icky yes, sticky even more so, the Gum Wall has achieved an odd sort of fame that perhaps appropriately has spread virally thanks to the Internet and netizens’ fascination with all things strange and unusual. 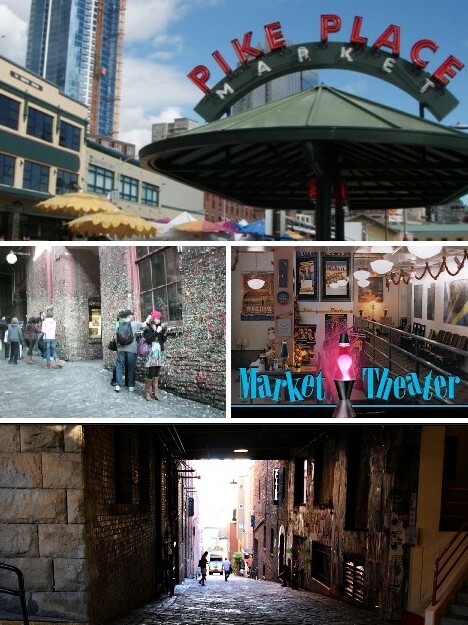 According to Market Theater Managing Director Jay Hitts, “Every time I walk out into the alley there’s lots of people getting their pictures taken in front of it, asking questions about it. It has become quite an attraction.” A bonus for Hitts and the Market Theater is there’s probably a lot less gum stuck under the theater’s seats. 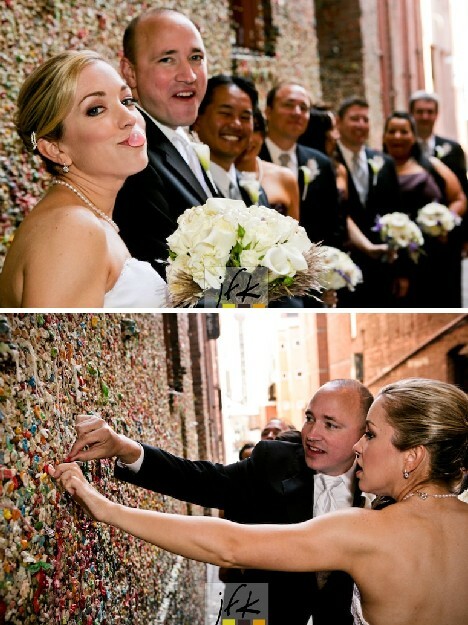 The Gum Wall has even been selected by newlyweds as a backdrop for wedding photos – the thought possibly being that like the gum on the wall, these new married couples will stick together come rain or shine. 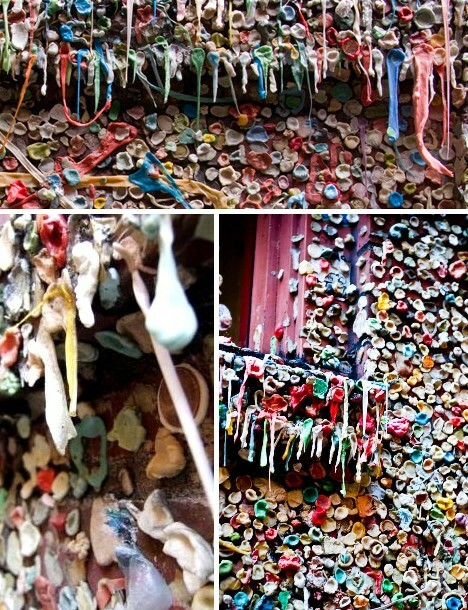 Speaking of which, the Gum Wall serves as a test case for the deterioration (or not) of used chewing gum left exposed to the elements over a long period of time. 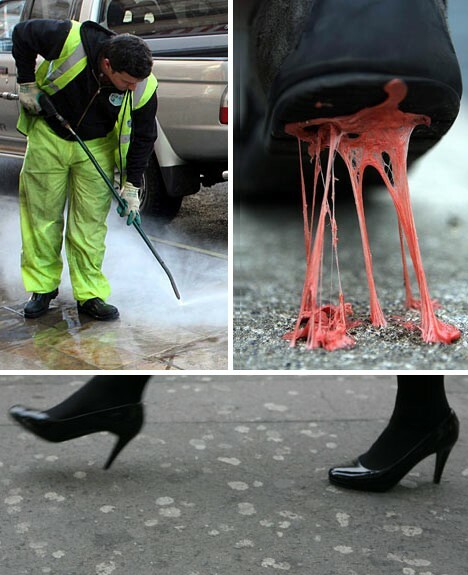 While seemingly frivolous, such information is of great value to municipal budget planners who devote appreciable annual sums to the cleaning and removal of dropped or otherwise discarded chewing gum. By all appearances, the gum is holding up quite well. Rain or freezing temperatures have little or no effect on the clumps. Hot weather and summer sun DO leave their marks, however: with the assistance of gravity, gum stuck to overhanging ledges tends to droop and sag over time. 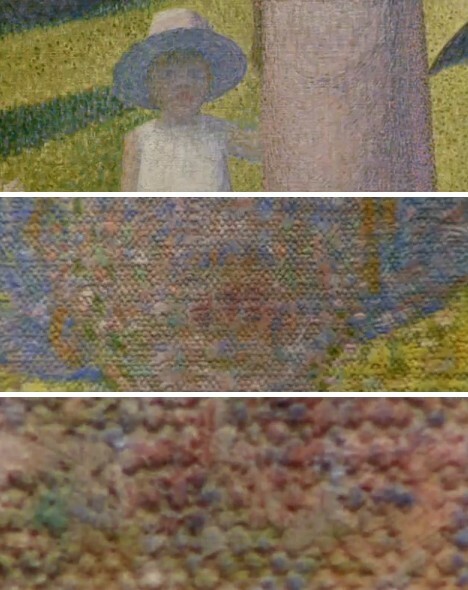 The effect resembles stalactites that grow down from the roofs of caves and natural caverns. 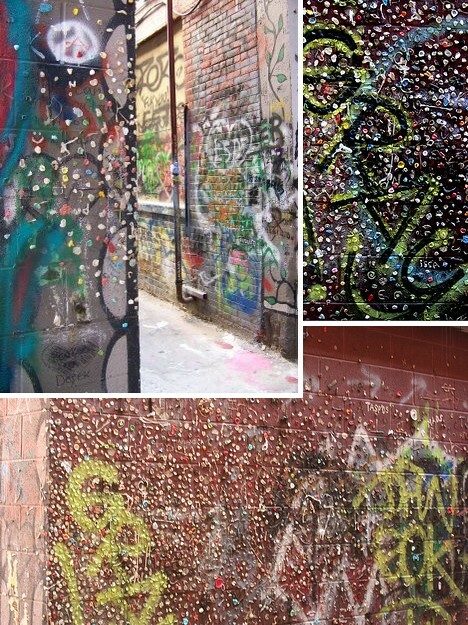 The Gum Wall’s emergence as a icon of chronic yet spontaneous urban graffiti has exerted an attraction to other street artists who seek an association between their efforts and the Gum Wall. The Pike Place Market’s “hands off” policy also acts as an encouragement – at least, it doesn’t discourage – those who work in mediums other than gum to add a little color and variety to the Gum Wall, especially at its fringes where the gum is less obtrusive. Seattle’s Gum Wall isn’t the only example of this fragrant genre of urban art, much to the chagrin of those who consider these displays dirty, unsightly, unhealthy or just plain ugly. 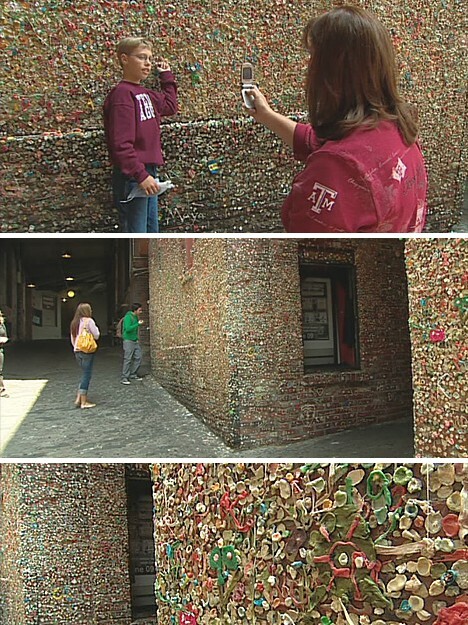 A rival exists several hundred miles down the coast: Bubblegum Alley in downtown San Luis Obispo, California. 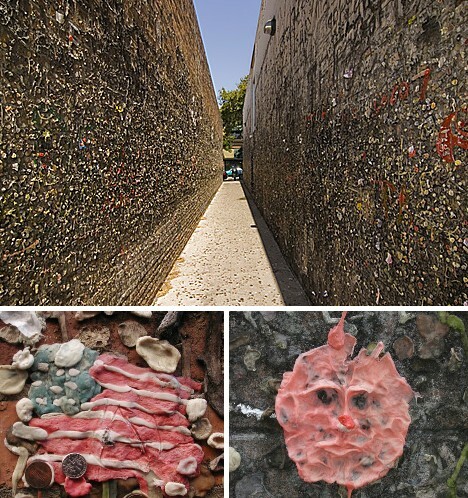 Bubblegum Alley boasts an older origin, estimated to be sometime in the mid-1950s, and it’s also double-sided. 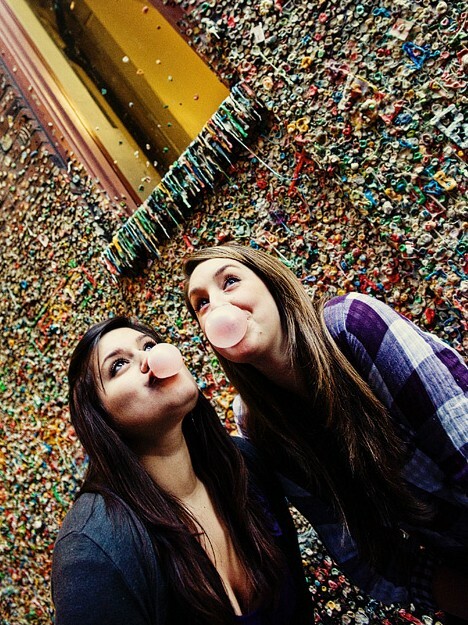 Which gum wall is best? That’s up to the individual to chews. Choose, that is. 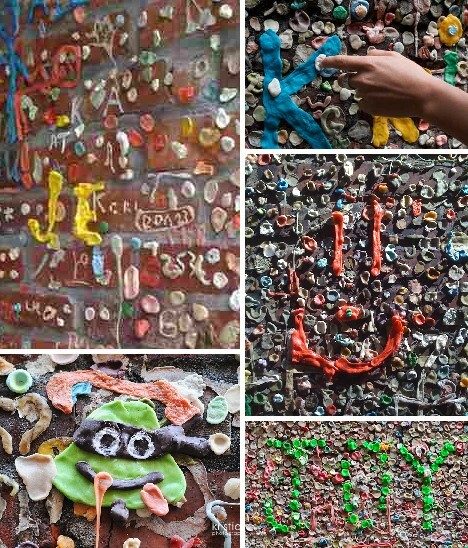 The Gum Wall, or something like it, is what you get when large-scale urban art germinates (pun intended) from some tiny, individual action performed without any concept, plan or idea. Who was the first bored theater-goer to take out their frustrations – and their gum – back in the early ’90s? 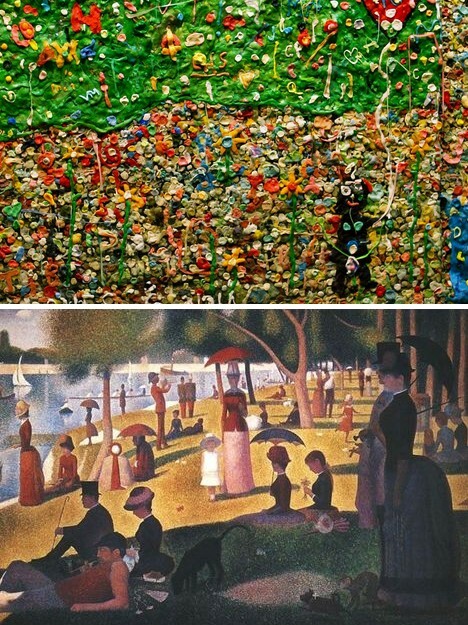 Unlike the gum firmly stuck to Seattle’s wonderful Wall of Gum, that fact has fallen through the pages of art history.